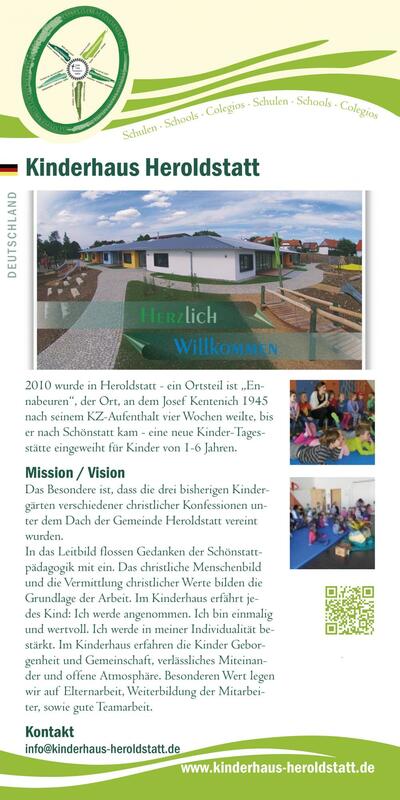 2010 a new Day Care Centre for children was blessed in Horoldstatt, a suburb of Ennabeuren. After his release from the concentration camp at Dachau in 1945, Fr Kentenich spent four weeks in Ennabeuren. The special feature of this Day Care Centre is that the three Kindergartens of the various local Christian churches have united under one roof in the Heroldstatt parish. The ideas of Schoenstatt‘s pedagogy became part of the missi- on statement of the centre. The Christian image of the human person and mediating Christian values form the basis of the work. In the House for Children each child experiences: I have been accepted. I am unique and valuable. I am confirmed in my individuality. In the House for Children the children experien- ce that they are sheltered and part of a community, that they can rely on the others in an atmosphere of openness. Special emphasis is placed on working with the parents, the continued education of the staff, and good teamwork.